This week we are having a go at connecting our Passion Projects to our Maths Statistics learning. Some of our projects might lend themselves to be connected to our statistics learning, some might not be. In our class we talk lots about the learning pit, this is a great chance to apply it to our learning! Last week we talked about skinny/ thin and fat questions. 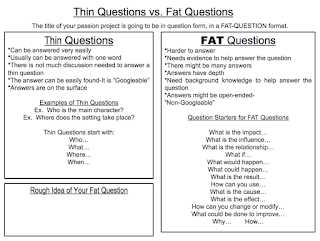 We designed some fat questions using the resource above. Have a look at the padlet to see the questions we came up with. 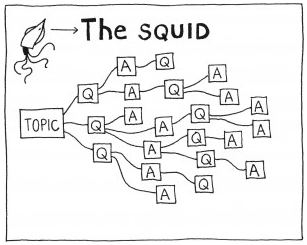 In order to connect these fat questions to our Inquiry we used a design thinking tool called, The SQUID. Students used the SQUID to delve deeper into their fat questions. At first glance it is as though we are 'thinning out' our fat questions. But What it allowed students to do was come up with some early assumptions that would be worth experimenting for, to either prove or disprove. The questions and subsequent answers from our SQUID became our multiple choice questions for our surveys. This is one way we have identified as being able to prove or disprove the assumptions we are making for our Passion Projects. The data from these questionnaires will be the basis of Statistics investigations. Look out for our individual blogs to see how we are progressing with our passion project! Kai ora,its very cool,maybe you should put more stuff on it,I have did something like this,but why did you pick this topic. That sounds great! I really like the question 'What would be impacted by being able to edit the D.N.A of humans?' I think this is a great question because it will be indefinite in the future. Why did you choose questions like this?